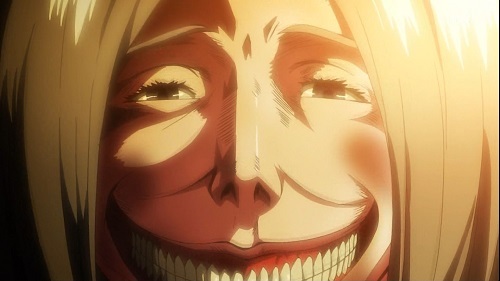 Here’s the thing: two weeks ago I mainlined Attack on Titan over the course of about seventy-two hours. It’s been a long time since an anime series hooked me like that. As I’ve decompressed from the unapologetic and heavy handed war story that is the last bastion of humanity fighting against derpy-faced giants, I’ve come to realize that there’s a lot of overlap between the tropes of Attack on Titan and Neon Genesis Evangelion. I mean, a lot of overlap. Even though the two series are set at opposing ends of a technological spectrum – Evangelion being set in the near future and AoT being a post-apocalyptic world reduced to early-modern levels of technology – they both showcase humanity’s utter inability to deal with a physically imposing threat. The Angels have something called an Absolute Terror Field that renders them impervious to any conventional weapons. Titans stand anywhere from three to fifteen meters in height and can only be killed by a stab wound to the back of the neck. And despite their derpy appearance, Titans excel at scooping up humans and eating them in the most gory way possible. Both AoT and Evangelion are set in fortress cities that act as a crucible for the broader story arc. With the Angels able to brush off the best efforts of the JSDF to defend Tokyo-3, stewardship of the fortress city falls to NERV. NERV exists as a paramilitary organization whose sole focus is supporting the Evangelion Units and their pilots. Likewise, the rank and file military of the Walled City prove to be both inept and piss-pants cowardly when confronted with an actual Titan. Only the Scouting Legion, who dare to brave the lands beyond the outer most wall, develop the courage and tactics to bring down a Titan with ease. Better people than me have written books and essays aplenty on Christian symbolism and subtext in Evangelion. Attack on Titan downplays the religous overtones to some extent. AoT’s modified Christianity espouses the walls of the Walled City as a gift from god. The more zealous among AoT’s people go so far as to worship the walls as an extension of god. When the Titans break through the outer most wall and threaten the interior of the Walled City, it constitutes both a threat against humanity and an affront to the religious status quo of the world. There’s also a character who dies and gets resurrected within the first ten episodes. When the first “Angel” attacks Toko-3, only a reticent Shinji Ikari is capable of joining with Evangelion Unit 01 and fending off this cosmic invader. From that point on it is clear that Shinji and his relationship to the Eva Unit will play a central role to the series. Similarly, Eren spends most of his first encounter with a Titan on the run from the lumbering monster. However, with a last name like Jaeger – German for hunter – it’s clear that his promise to rid the world of all Titans is not idle. The plots of both series then develop around this special nature of the two leading male characters. Yet neither Shinji or Eren ever get to be a traditional hero. They are only strong when in a blind rage. They constantly doubt themselves and look to others for approval. And of course, both characters are dripping with father issues. Rei is Shinji’s counterpoint in Evangelion (She’s also possibly a clone of his mother, which makes it really weird when Shinji turns her into a point in his love triangle), but where Shinji is manic and insecure, Rei is cold and effective. Whenever Shinji falls apart and refuses to pilot his Eva Unit, Rei steps up and gets the job done. It almost perfectly mirrors the relationship between Eren and Misaka. Though Eren eventually proves to be a “Chosen One,” Misaka is a ruthless and effective Titan killer from the outset. Not to mention the fact that whenever Eren thoughtlessly charges into battle, Misaka is the one who saves his life. Their burgeoning sexual tension is made all the more creepy in that Misaka is Eren’s adoptive sister. Okay, this last part doesn’t have anything to do with the story. 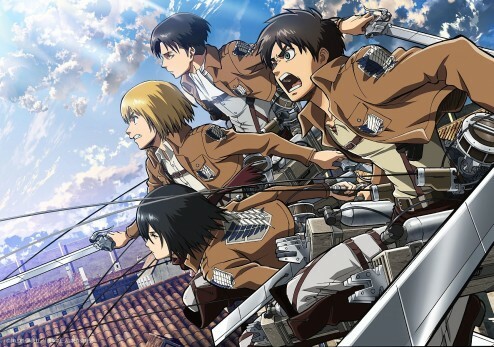 But just as the Evangelion soundtrack became the anthem for my fourth year of university, so too has Attack on Titan’s soundtrack become the soundtrack to my mid-April. They’re similar, but the mangaka that created attack on titan got his idea from the muv luv game. an also movies like godzila.